Explore CMS Resource Library for the most up to date information concerning Improvement Activities (IA). Utilize the search filters to narrow down your search by Performance Year, QPP Reporting Track, Performance Category and/or Resource Type. This file contains important and pertinent information relating to suggested documentation for each MIPS performance category. 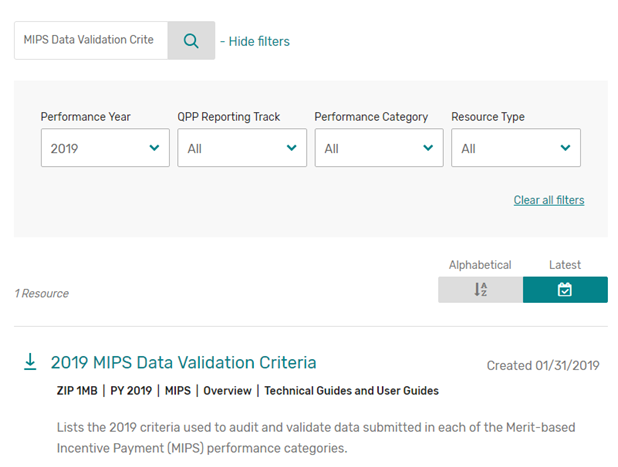 As displayed in the screenshot below, from the CMS Resource Library, you can easily find this file by selecting the performance year you are looking for and entering “MIPS Data Validation Criteria” in the key word search. As a recognized leader in improving health care quality IPRO provides innovative services and solutions to create healthier communities.